Aral recently released the videos from last September’s Update conference. You can watch the video of my talk if you like or, if video isn’t your bag, I’ve published a transcription of the talk. I went in to the lion’s den to encourage the assembled creative minds to forego the walled garden of Apple’s app store in favour of the open web. It certainly got people talking. Addy Osmani wrote an op-ed piece in .net magazine after seeing the talk. The somewhat contentious talk was followed by an even more contentious panel, which Amber described as Jeremy Keith vs. Everyone Else. The video of that panel has been published too. My favourite bit is around the five-minute mark where I nailed my colours to the mast. Aral: I don’t think that’s a valid analogy. But I am creating stuff that can be accessed on all those devices because an iPhone and Windows Phone 7 and Android—they all come with web browsers. I was of course taking a deliberately extreme stance and, as I said at the time, the truthful answer to most of the questions raised during the panel discussion is “it depends” …but that would’ve made for a very dull panel. Unfortunately the audio of the talks and panels from Update hasn’t been published—just videos. I’ve managed to extract an mp3 file of my talk which involved going to some dodgy warez sitez. I wish conference organisers would export the audio of any talks that they’re publishing as video. Creating the sound file at that point is a simple one-click step. But once the videos are up online—be it on YouTube or Vimeo—it’s a lot, lot harder to get just the audio. Not that I have anything against the moving image; it’s just that television, film and video demand more from your senses. Lend me your ears! and your eyes. With your ears and eyes engaged, it’s pretty hard to do much else. So the default position for enjoying television is sitting down. A purely audio channel demands only aural attention. That means that radio—and be extension, podcasts—can be enjoyed at the same time as other actions; walking around, working out at the gym. Perhaps it’s this symbiotic, rather than parasitic, arrangement that I find engaging. When I was chatting with Jesse from SFF Audio he told me how he often puts video podcasts (vodcasts?) on to his iPod/iPhone but then listens to them with the device in his pocket. That’s quite a waste of bandwidth but if no separate audio is made available, the would-be listener is left with no choice. So conference organisers: please, please take a second or two to export an audio file if you’re publishing a video. Thanks. 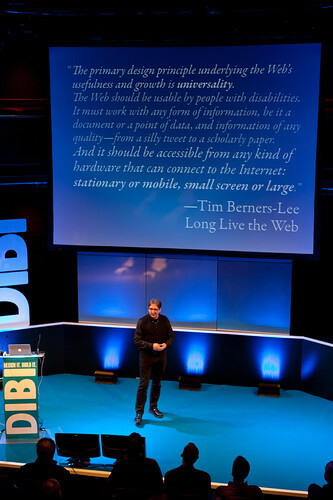 As ever, I had a lot of fun moderating the hot topics panel at this year’s Web Directions @media in London. Thanks to all of you who left questions on my blog post.